The Solar Inverter Industry has remained relatively stable compared to the solar panel industry due to fewer number of players and higher barriers of entry. The top solar inverter companies are mostly European though Asian companies particularly from China are making aggressive expansion plans. The solar inverter industry is expected to grow roughly inline with the growth in solar panels of around 10-20% in 2012, however the revenues will remain flat as price declines hit the top line of the solar inverter manufacturers. While the solar inverter sales remains stable in 2012, marketshare of the top players will see a decline as the Chinese market gains importance in 2012 at the expense of the European markets. The biggest solar inverter companies like SMA, Fronius, Kaco are based in Europe with most of these sales coming from that region. They are finding it difficult to compete in the newer growing markets of China and Japan both because of implicit and explicit barriers (Japan may in fact see a shortage of inverter due to JCET certification). Besides the Chinese inverter companies, other Western companies like AEIS ,GE, Seimens and Emerson too are seeing marketshare increases coming at the expense of the established manufacturers. The stock price of SMA Solar touched new lows, as investors are anticipating that the company will be unable to face the onslaught of the Chinese solar inverter manufacturers. Note SMA Solar held a dominating 40% solar inverter global marketshare in 2010. SMA Solar however, is now feeling the heat of the competition as solar energy prices continue to go down steadily. Chinese solar inverter makers are also selling photovoltaic inverters at almost 30-40% discount over the Western producers. Though the quality of the Chinese made inverters is lower they are slowly improving it and the price differential is quite huge. SMA Solar is set to lose out in the biggest solar inverter market. 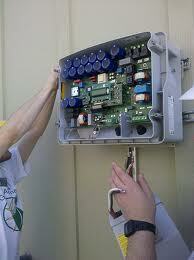 Also SMA Solar Inverters suffer from the problem of higher costs compared to the Asian solar inverter players. Even US solar inverter companies like Solectria have lower costs than SMA. As solar system price has come down drastically, pressure has increased tremendously on solar inverter companies to lower prices. The days of 40-50% GM for solar inverter players are gone for good and the stock price has already discounted that. The biggest fear is that SMA will go down like the previous industry leaders in solar technology, Q-Cells and Centrotherm. Both of these companies were the leaders in their respective solar segments only 2-3 years ago. But competition from China has changed their fortunes quite dramatically such that both have gone bankrupt. SMA Solar too faces the same outcome unless it is able to pull off a miracle. Times have been tough for Western Green Companies even as leaders like First Solar and Vestas have seen their stock prices tank by more than 90% from their peak. The global PV inverter market is predicted to grow by 23% in 2012 and hit almost 32GW according to IMS Research. However, IMS Research forecasted that industry revenues to grow by just 3% in 2012 to hit US$7 billion for the first time. The analysis found that in 2011, global inverter shipments grew by more than 12%, despite the excess inventory overhang from the prior year, and reached 27GW, but the European market shrank considerably. Europe’s dominance of the PV inverter market is predicted to continue to wane due to its two biggest markets, Germany and Italy, facing significant reductions in their annual installations. “Europe’s share of PV inverter shipments and revenues was over 80% in 2010; however we forecast this to fall to less than 40% in 2016 and revenues not to return to 2011 levels in the next five years. This in itself presents a huge challenge to suppliers, which are mainly European, with the majority of their facilities and customers located in that region,” commented Sharma. Analysis showed that whilst the European outlook is not so bright, the global picture for PV inverter suppliers looks somewhat better; highlighting the fragmenting nature of the industry that now needs to look to emerging markets for future growth. Global shipments are predicted to continue growing at a double-digit rate over the next five years, with revenues exceeding US$9 billion by 2016. IMS Research indicated that of the more than 150 active suppliers found that the suppliers in the top five remained unchanged, albeit with some slight changes of rankings between them. SMA Solar Technology retained its number one position in 2011 despite losing further market share, followed by Power-One, Kaco, Fronius and RefuSOL. IMS Research found however that the biggest market share gainers in 2011 were in fact those outside of the top 10, showing that the industry may not be consolidating just yet. “Start-ups Enphase Energy and SolarEdge were two of the biggest market share gainers in 2011, whilst we also saw considerable gains from Advanced Energy and Emerson,” noted Sharma.